What is Business Technology Support? Business technology support can generally be described as a range of services that deliver assistance to users of technology products such as computers, software and mobile devices within an office setting. Help! Most of us are familiar with the type of technical support that assists users via e-mail, a help desk, online chat or a call center. This type of help covers technical assistance with equipment problems or software issues. Technology support also comes in the form of remote computer repair. This type of support enables a technician to access the user’s desktop via the internet and transfer diagnostic and repair applications. The technician does not come to your location. This can be an effective process for computer optimization or the removal of computer viruses and spyware. This type of technical support is very popular with business clients with home offices who can’t drop everything to the take their equipment into a shop for repairs. Managed Services Providers can manage all of your businesses technology or just a few specific pieces on an on-going basis. Typically, this is set up as a contracted monthly fixed fee. This service can include monitoring of servers, network security, back-up services, cloud services and vendor management. Some Managed Services Providers also offer dedicated help desk support and on-site visits by technicians. Managed Services Providers have become an increasingly common strategy for small businesses that do not have their own in-house tech support staff. It’s an extremely effective way for small businesses to manage costs with a monthly contract while gaining access to new technology and skilled technicians. IT Consultants and Technical Advisors also offer business technology support at a higher level. 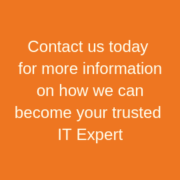 The IT professional can work closely with a client to understand the long term plans and goals of the business. This type of working relationship allows the IT professional to make strategic recommendations and develop a technology plan for the business. This involves keeping the client informed about new technology solutions that will enable the business to grow and become more competitive. The advantage of this type of technical support is that the business gains access to an IT professional who keeps an eye on the future and “big picture” thinking when it comes to new technology services, products and solutions. Yes, business technology support covers a lot of service options. Now you just need to decide what level of technology support your business needs! https://computertroubleshooters.co.uk/wp-content/uploads/2018/11/computer-troubleshooters-3.png 0 0 briancraigie https://computertroubleshooters.co.uk/wp-content/uploads/2018/11/computer-troubleshooters-3.png briancraigie2014-04-30 13:13:092014-06-11 03:33:57What is Business Technology Support?